It may appear that we are going somewhat off-topic with this post. Strictly speaking, Donkey Kong, the game that is Mario's birth-ground, does not seem an appropriate subject for a blog titled beforemario. 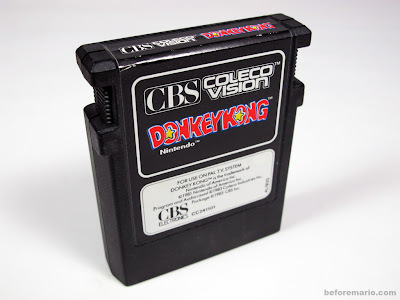 But it is not too farfetched, to state that without Donkey Kong this blog would not exist. 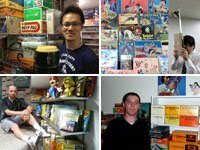 And it is therefore more than appropriate to put a spotlight on Miyamoto's premiere master piece; the start of my fondness for Nintendo, as well as the start of my collection. With that in mind - let's dig in. 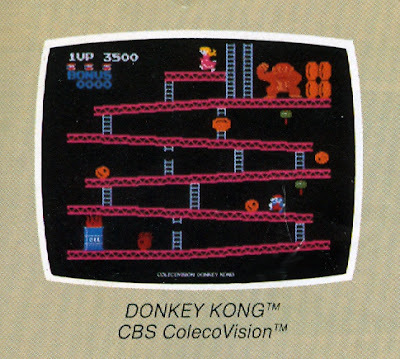 It is not my intention to introduce or explain Donkey Kong. That would be silly. Unlike many of the Nintendo toys and games featured on this blog, I can safely assume that you know all ins and outs of the game's origine, have played its four levels a zillion times, and watched The King of Kong more than once. Right? 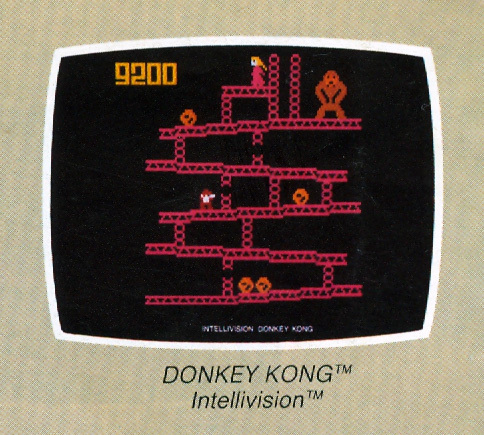 What I would like to show you instead, is my first - ever - Nintendo game. The first piece of what would become a mountain of games. The first snowflake of an eventual collecting avalanche. 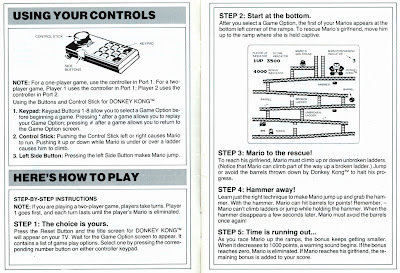 Here it is: the actual first Nintendo item I bought, almost thirty years ago. Let us rewind three decades of time, to the Summer of 1982. 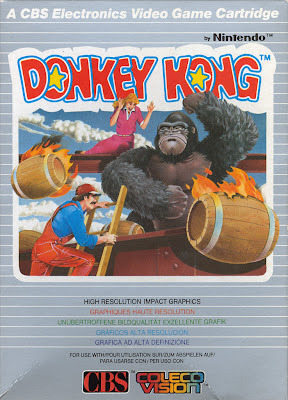 For months, I had been pumping quarters (well, actually, guilders) into Nintendo's arcade revelation Donkey Kong. 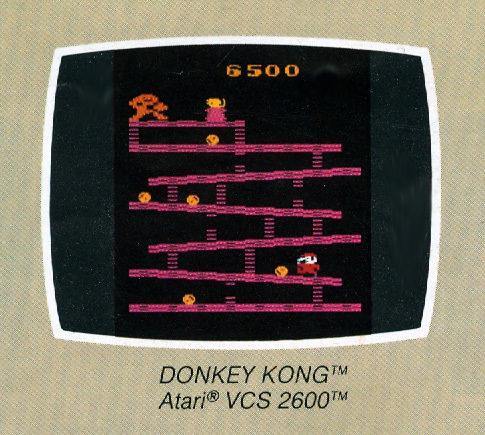 I did not own a video game console at the time, and got all my pixelated kicks at the local arcade. 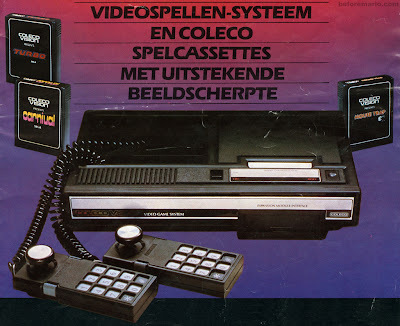 Now, I must admit that I had never really liked the Atari VCS 2600, which was the big home video game daddy around that time. 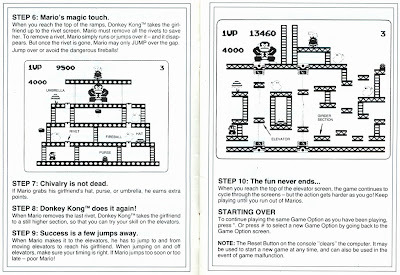 I had played it occasionally, but could not get over the difference between its game play and what was on offer at the arcade. As a result, it never made it to my 'must have' list. 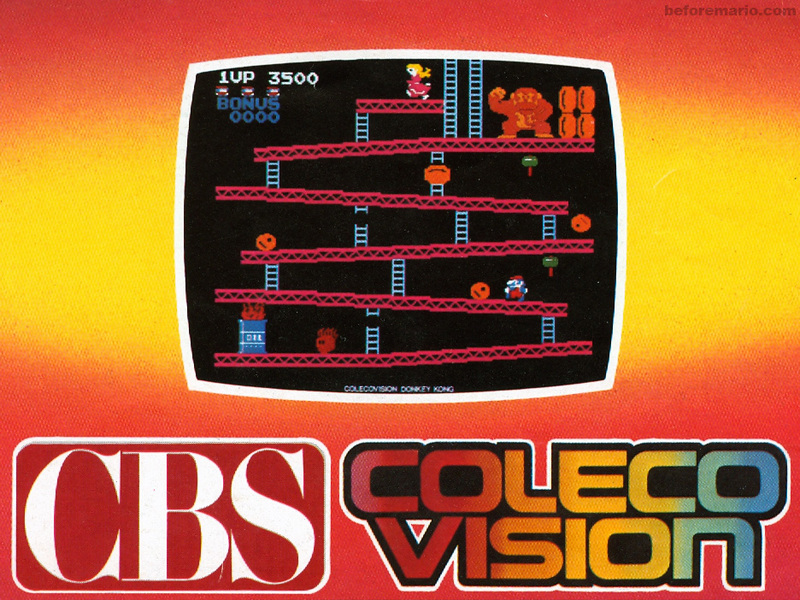 I remember seeing Atari's home conversions of Space Invaders and especially Pac Man (two of my favorite games at the arcade) and not warming to these versions at all. Then one day, I walked into a toy store, and saw a stack of brochures laying on the counter. 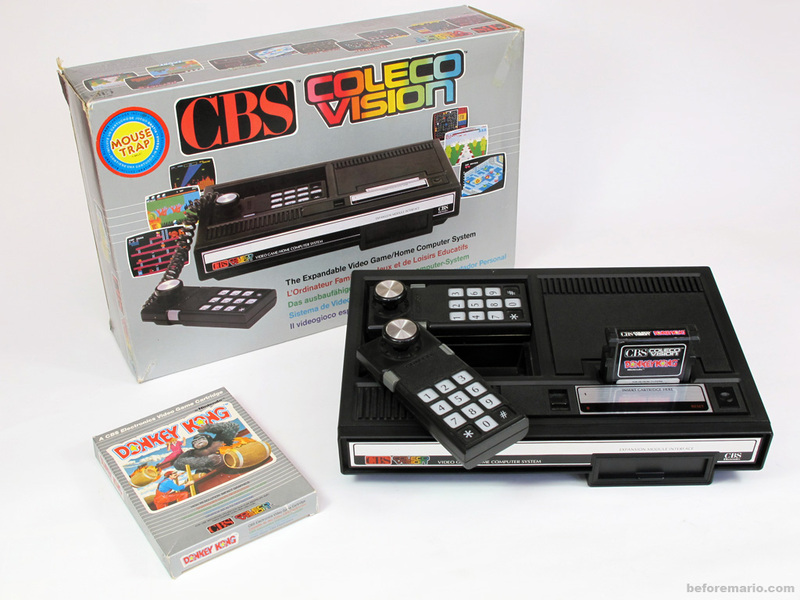 It featured a new game console about to be released: CBS's ColecoVision. The scan shown above is from the actual copy I picked up that day, thirty years ago. Given the many times I have thumbed through it (and drooled over it), in the months that followed that moment, it looks surprisingly fresh. 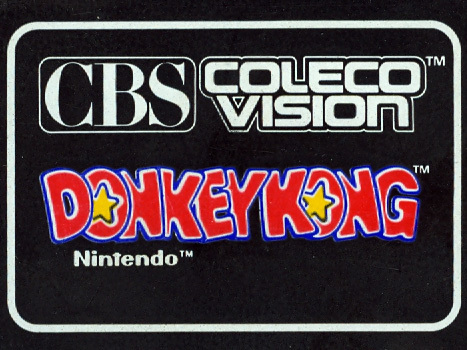 The main selling point of the ColecoVision was a mouth-watering home conversion of Donkey Kong. A screen shot of it was put prominently on the front of the brochure. 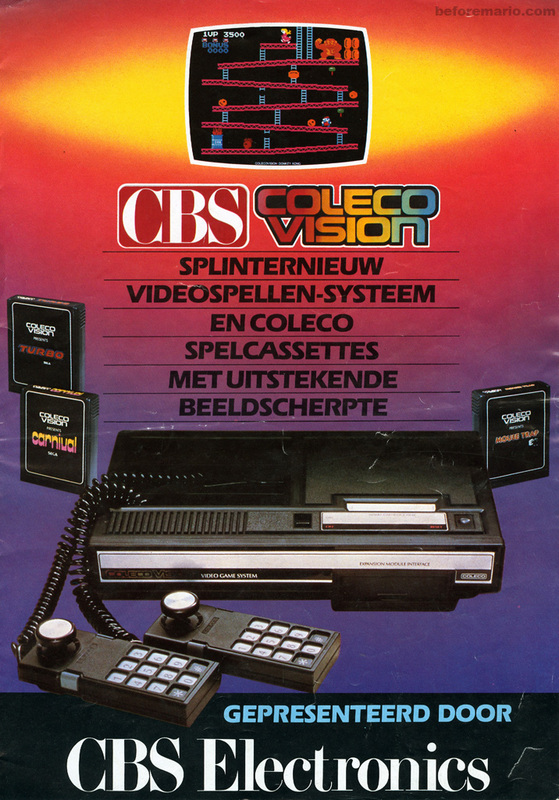 With the yellow high-light behind it, it stood out more than the actual console itself. And with reason. This was its killer app. Which version to pick? Difficult, difficult. Inside the brochure, three pictures told a clear story, with a simple side-by-side comparison of the three home versions of Donkey Kong, for the ColecoVision, the Atari 2600 and the Intellivison. Is that a monkey up there? Or a bear? 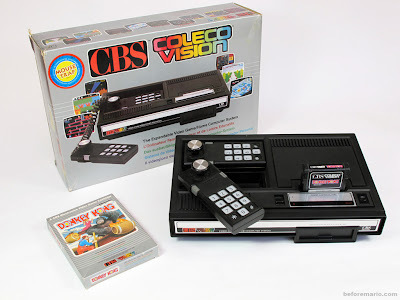 Never mind that Coleco had handled all three conversions, and possibly given the version destined for their own hardware platform maybe a little bit of extra attention and TLC. The difference in quality, foremost visually, was staggering. The ColecoVision version of Donkey Kong was no pixel-perfect conversion either. 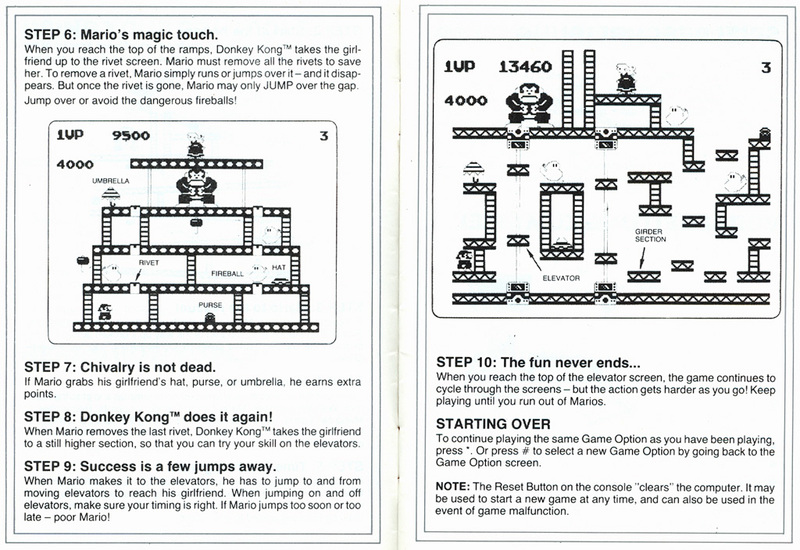 The first level, for instance, was missing one platform (it had five, instead of the original's six). And more was missing, as I would soon find out. But it was close. Ah yes. I'll have this one, please. So, long story short: desire swelled up in me. I had to have it. 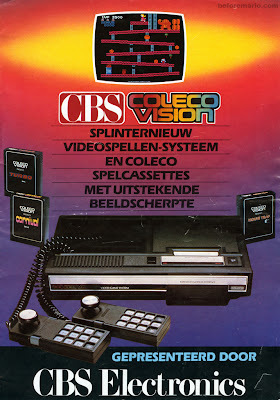 And after months of saving up, I became the proud owner of a ColecoVision. 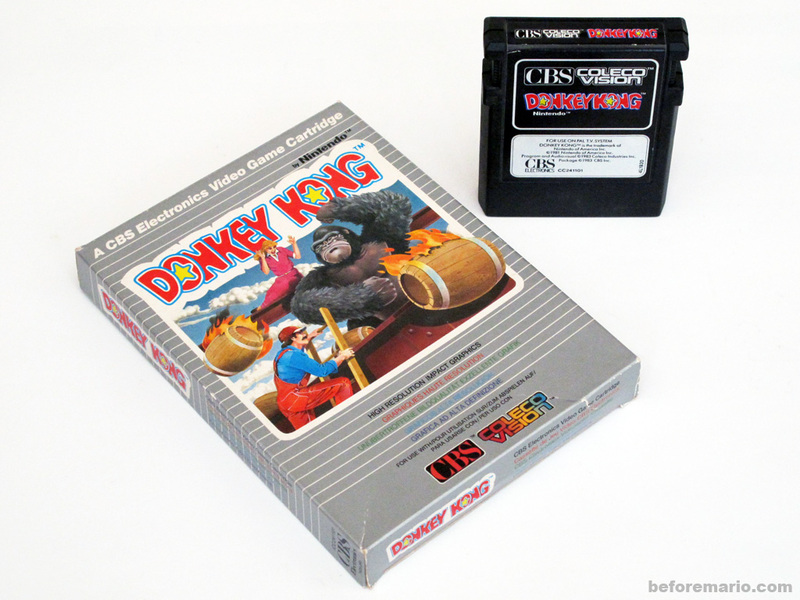 Unlike in the US, where Donkey Kong came packed with the console, in Europe you had to buy it separately. Which I did, obviously. A magical moment. Look at it. Hours of fun, packed in a black piece of plastic. I slotted the cartridge into the machine and started playing. Initial amazement at the feast of color and sound was suddenly replaced by confusion. After three levels the game started again at the first. Wait a minute... where is the factory level? After some moments of disbelieve, and re-reading the manual, I had to take in the truth: there was no factory level. My favorite level had been sliced during the conversion process. Alas, no running on conveyor belts. No jumping over pies. After recovering from that somewhat disappointing news, I was still very happy with my own home arcade, and played Donkey Kong for hours on end. 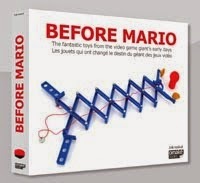 After this first Nintendo purchase came another, and another, and another, and another. But thirty years on, this one remains one of the most special. My first DK experience was the ColecoVision too, but I also had the tabletop LED game that was also put out by Coleco too! Great post! The first time is always the greatest. Christopher: do you still have the tabletop? That's a great item too.